I passed my PMP exam on 13th April 2017 in my first attempt with MPs in all knowledge areas. Believe me I started crying at the Prometric centre desk after seeing Congratulations message on the screen. P V Sindhu won silver in Olympics, for me this was not less than winning a medal in Olympics. I will not say exam was easy. It was tough and tricky. Till last click, I was not sure if I will pass the exam or not. It took me 3 hours 45 minutes to complete all 200 questions. Though I marked many questions (around 40) but I anyway ticked them with the most suitable answer before so I could just refer them quickly in last 15 minutes. I changed only 1 answer. In first 15 minutes, when I was supposed to read instructions, I finished them in 5 mins and started checking my comfort zone. To remove shoes or not? How do I sit for 4 hours? To remove jacket or wear it (According to AC )? I asked for Noise cancellation headphones as I know myself that I cannot even concentrate with keyboard noise. I didn't write any brain dump as I felt it was not needed and I was not sure if I should spend time and energy writing that. Got 2 paper sheets and 2 pencils which I used for mathematical calculations. Didn't want to waste any time so didn't take any breaks in between as I didn't want to break my flow for the exam. Now little background about me, I am a working woman staying with 2 children, husband and mother-in-law. Preparing from past 6 months with so many social, official responsibilies. Sometimes I managed to study for 2 hours and sometime 7 hours a day. Utilizing free time in office, home, travelling or even when waiting for kids cricket class/chess class to get dispersed. My husband thought I have gone crazy and i am over studying. But that is must for PMP. If you don't study every day, you will forget everything. I completely relied on my notes as I am used to make notes from my childhood time. 600 pages PMBOK became 90 page word document for me. Mugging up won’t work. Understand the concept. I attempted more than 6000 questions (2000 questions from KnowledgeWoods). Yes, you read it right, 6000 questions- all free. No, I didn't buy any simulators. Didn't spend anything extra other than 35 hours PDU training (KnowledgeWoods) and PMP exam fee. All the books I downloaded free from the internet in the form of PDF copies. I relied on my own notes. I read PMBOK and Headfirst once. Made notes, started mock exams very early(even though I was not knowing all the concepts at that time). Studied my answers. Yes, right or wrong, i studied all the answers and added those explanations in my notes. Referred my notes again and again, kept adding concepts as I read the books and other materials. I used excel sheet for ITTO (I got it from some website, don’t remember). I went through again and again through all ITTOs. Made separate ITTO Excel sheet for important ones. Example: EEF, Project Charter, Project Management Plan. I didn't study much 1 day before the exam. Rather, I was relaxing and playing with my kids. Also, I did appear only for 2 full length mocks as It was difficult for me to sit for 4 hours - without getting disturbed by kids at home. But as I mentioned earlier I went through around 6000 questions. Afterwards, I even understood the level of questions, easy-medium-hard. In real exam, don't think about 25 questions which would not be calculated in exam as we don't know which 25 questions would be considered. Goal should be to select the best answer for all 200 questions. Main books I used were PMBOK, Headfirst and few topics from Rita. I attempted several mock exams, izenbridge, oliver lehman, Rita's chapter end questions, headfirst questions, exam central questions, simplilearn questions and few more. I didn't memorize glossary as I used to go to sleep whenever I tried to mug up definitions. But I made notes of the definitions which I came across my mock exams and kept reading them. Now, coming to my PMP exam. 75% were situational questions. What to do and what not to do? Got around 15 formula questions. Which I found not that much difficult.Few questions I got on 2nd, 3rd chapter of PMBOK. Understanding Change management is must. I got around 25 questions on change management. Book your exam as soon as possible then only you will be serious about the exam. It will create pressure to study. Last but not the least, Use highlight function and strike out function in exam. Elimination method for striking out answers helped me a lot. Also, used few tips which I learned from different youtube videos like read the last sentence of question first. One thing I cannot forget to mention, Saket Bansal izenridge youtube videos. This guy explains everything in so simple terms that I was imagining his face explaining the concepts - in my exam when I was getting some question related to his youtube videos. I am so much inspired by him that I wish I could have done PMP earlier and could have taught PMP concepts to others and helped them. Most of the Saket's youtube videos I used were- EAC, Different types of procurement contracts, Risk Response plans, 7 basic tools for Quality, HR theories and many more. 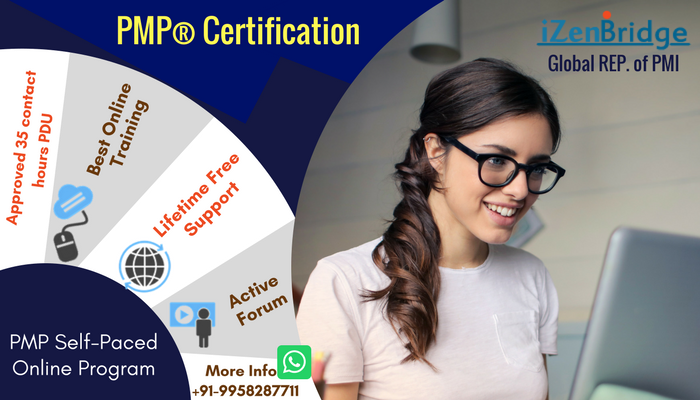 I feel he is born to teach PMP concepts to us now I am going to concentrate on his videos related to how to earn PDUs after clearing PMP Exam. So, All the best for your exam. Enjoy the journey of PMP exam.Will not write about filling application form etc. There are many other websites for that. Be confident, be happy and relaxed. Last edited by manju_118@yahoo.com on Wed Apr 19, 2017 2:27 am, edited 3 times in total. Congratulations and Thank for using our PMP videos and also this forum. Big thanks for sharing your PMP preparation journey with us.